BofA Sounds The Alarm: "Biggest Sell Signal In 5 Years Was Just Triggered"
One week ago, Bank of America's Michael Hartnett showed that as a result of the ongoing stock market euphoria, the 4-week inflow into stocks had hit the highest ever, although he suggested that we were "not quite there" yet when it comes to euphoria becoming a "selling" trigger. So fast forward one week, when according to BofA's latest weekly flow show, we finally made one-week history as investors poured the most money on record into equity funds, and warning that with the Bull & Bear indicator surging to 7.9 "the highest since last sell signal >8 triggered Mar’13", a tactical pullback in sky-high markets in February and March is now "very likely". 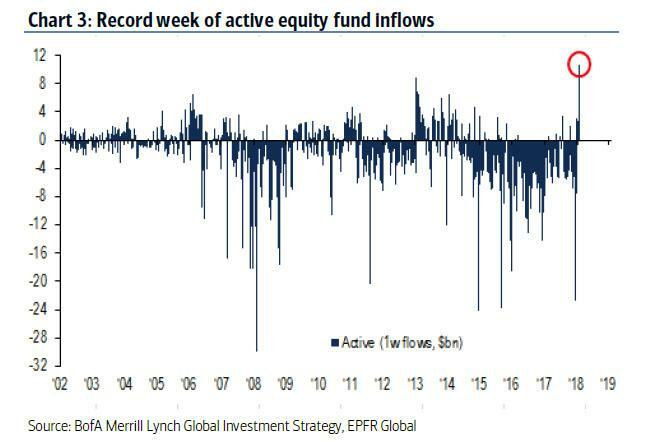 Overall, as part of what Hartnett calls a "non-stop euphoria cabaret" markets saw a record $33.2bn inflow to equity funds this week, record $12.2bn inflow to active funds, $1.5bn into gold (50-week high), as well as record inflows to tech & TIPS. AUM of SPY ETF now = GDP of Denmark. 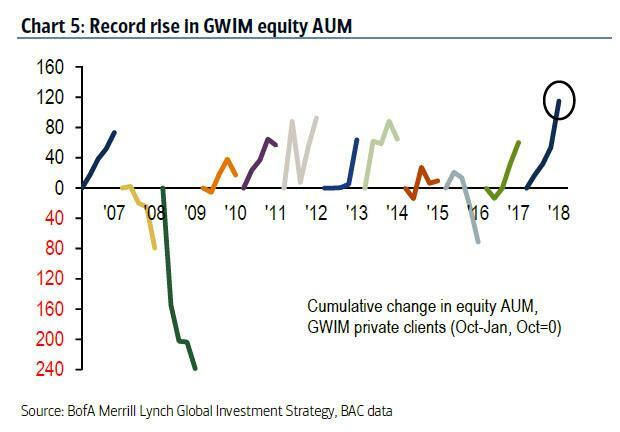 broken by region, it was more of the same as U.S. equities saw $7bn of inflows, Europe $4.6bn, Japan $3.4bn; while EM funds had the 2nd best week of inflows on record at $8.1bn. 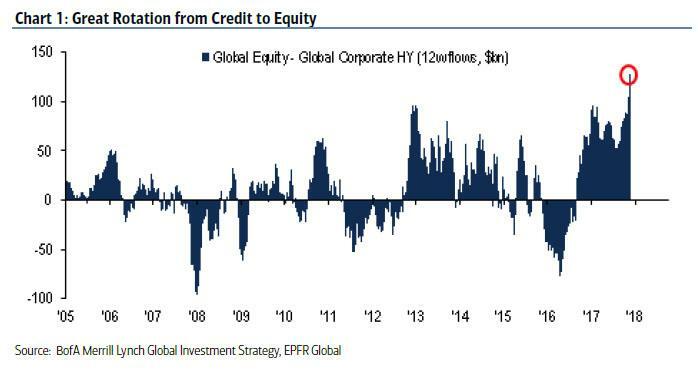 And while the rotation from debt to equity has not yet happened, a subset of debt - junk bonds - is clearly throwing in the towel, as shown in the chart below, which shows that equity flows relative to credit flows at all-time high (Chart 1 – HY redemptions 11/13 past weeks & slowing IG inflows); here Hartnett reminds us that "credit leads equities (except in bubbles)." 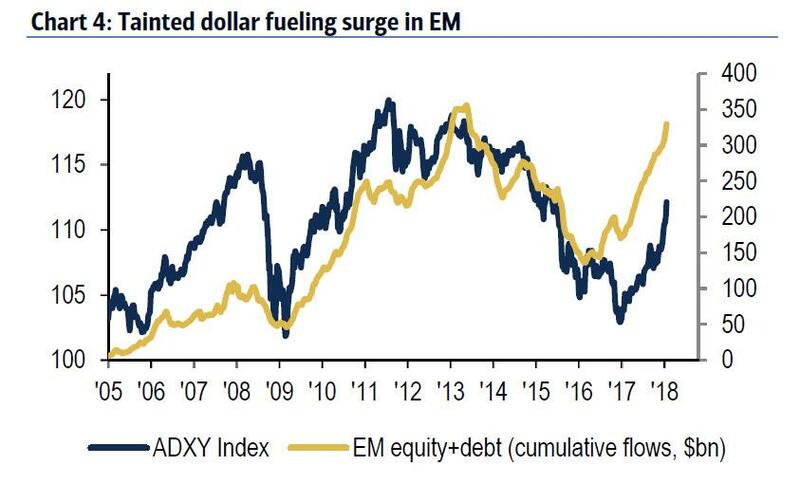 A little more euphoria and it will be time to sell emerging markets: "EM Equity Flow Trading Rule…$5bn into EM equities next week triggers 1st sell signal since Aug’14"
So going back to the BofA "sell signal" that was just triggered, Hartnett explains that the BofAML Bull & Bear indicator just surged to 7.9, highest since last sell signal >8 triggered Mar’13. From here, inflows into HY/EM debt/equity funds would flip “soft sell” for risk assets to “hard sell”. 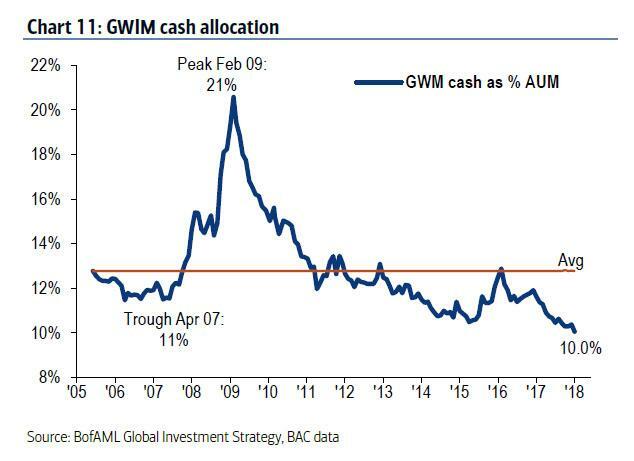 ... and cash allocation at record low (10%). Should one trust the BofA Bull and Bear indicator? 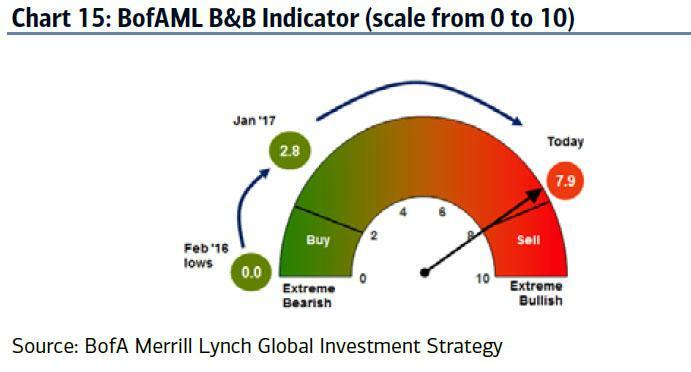 Well, yes: "BofAML Bull & Bear indicator has given 11 sell signals since 2002; hit ratio = 11/11; "
What happens next? Well, once hit, the average equity peak-to-trough drop following 3 months = 12% (backtested, Table 1); note the last Bull & Bear indicator flashed was a buy signal of 0 on Feb 11th 2016. Putting it all together, BofA warns that a "tactical S&P500 pullback to 2686 in Feb/Mar now very likely." "The Art of Falling Apart: US dollar key catalyst; note US-Europe FX spat sparked ’87 crash; higher US$ “pain trade” = risk-off coming weeks; we reiterate 2018 calls: Big Long = Vol, Big Short = Credit, Big Risk = Equity Bubble (driven by $10.3tn of negatively yielding debt), Big Rotation from Davos Man to Joe-Six Pack portfolio"